Children younger than 16 should not ride on an Adult ATV. They are twice as likely to be injured while riding an Adult ATV than a Youth ATV. By following these key safety tips, hundreds of deaths and thousands of injuries related to ATVs could be prevented. 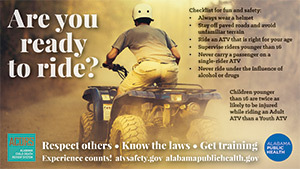 For more information on ATV safety, visit the US Consumer Product Safety Commission.